Q: All of the following can be the symptoms of reversible posterior leukoencephalopathy syndrome (RPLS) (PRES) except ? Headache in PRES syndrome is usually characterized as constantly moderate to severe, non-localized, and unresponsive to analgesia. Anton's syndrome, also known as Anton–Babinski syndrome, is an interesting phenomenon in which despite presenting clear evidences to patients of their blindness, they remain adamant that "they can see". This is due to confabulation supported by fill in the missing sensory input. Not necessarily but if present, the hypertensive crisis may precede other symptoms by 24 hours or longer. 1. Stott VL, Hurrell MA, Anderson TJ. Reversible posterior leukoencephalopathy syndrome: a misnomer reviewed. Intern Med J 2005; 35:83. 2. Fugate JE, Claassen DO, Cloft HJ, et al. Posterior reversible encephalopathy syndrome: associated clinical and radiologic findings. Mayo Clin Proc 2010; 85:427. 3. Lysandropoulos AP, Rossetti AO. Postictal cortical visual impairment: a symptom of posterior reversible encephalopathy. Epilepsy Behav 2010; 17:276. Q: Your cardiac valvular diagnosis? Q: Which of the following antihypertensive agents may have a direct synergistic effect during blood transfusion reactions? The synergistic effect of blood products transfusion and ACE-I causing hypotension is blamed on increased bradykinin levels in the transfused product. Some experts have suggested to hold ACE-I for 24 hours prior to blood products transfusion, but evidence to use this practice is weak. 1. Metcalf RA, Bakhtary S, Goodnough LT, Andrews J. Clinical Pattern in Hypotensive Transfusion Reactions. Anesth Analg 2016; 123:268. 2. Owen HG, Brecher ME. Atypical reactions associated with use of angiotensin-converting enzyme inhibitors and apheresis. Transfusion 1994; 34:891. Q: Urea is called an "ineffective osmole". What does it mean? Answer: Urea equilibrates freely across the cell membranes, means when the plasma concentration of urea changes, the intracellular concentration of the solute changes in parallel, and there is little or no water shift across the cells. In contrast, glucose alters the balance and distribution of water across the cell membranes, and is called an "effective osmole". Q: 54 year old male is back in Emergency Department(ED) with chest pain ten days after his discharge from hospital. He was previously admitted for Acute Myocardial Infarction (AMI). Due to EKG changes in ED, patient is admitted to ICU. Further workup confirmed acute pericarditis. Which of the following is NOT a good choice to use during management of acute pericarditis following AMI? In symptomatic pericarditis after an AMI, NSAIDs should be avoided as it may impair scar formation. Recommended treatment is aspirin (ASA) with colchicine. Acetaminophen can also be used as symptomatic treatment. PPIs help to relief GI symptoms secondary to ASA and colchicine. Q: Which one drug need adjustment on Continuous Renal Replacement Therapy (CRRT), because it get adsorption to the membrane? Many drugs get adsorption to CRRT membrane but does not require adjustment of dose solely for adsorption. Colistin is the only drug which requires adjustment of dose as 40 to 60 percent of it get adsorption to membrane, and very little get recovered in the effluent. Markou N, Fousteri M, Markantonis SL, et al. Colistin pharmacokinetics in intensive care unit patients on continuous venovenous haemodiafiltration: an observational study. J Antimicrob Chemother 2012; 67:2459. Q: 34 year old female with 2 episodes of right sided spontaneous pneumothoraces in last 2 years presented again with right sided chest pain. 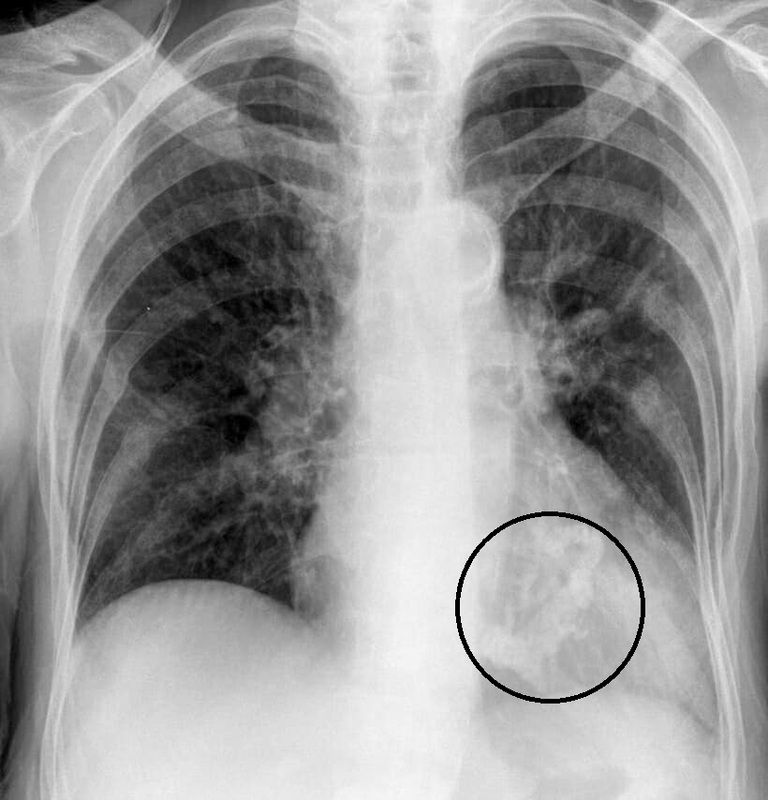 This time a component of hemothorax is also noted on radiological workup. Diagnosis of cataminal pneumothoraces and thoracic endometriosis is made. All of the following are parts of management of recurrent cataminal pneumothoraces except? Thorax is the most frequent site of extra-pelvic endometriosis. Gold standard diagnosis is histological confirmation. Without histological diagnosis, it should be referred as 'probable thoracic endometriosis'. Patients with frequent symptomatic presentation requires further surgical intervention with blebectomy, pleurodesis and hormonal suppression. Pneumonectomy is not required but in resistant and in debilitating cases pleurectomy or hysterectomy with bilateral salpingo-oophorectomy (BSO) may be needed. Cataminal pneumothorces refers to episodes of pneumothorax corresponding to menses of the patient, otherwise should be called noncataminal pneumothraces. 1. Alifano M, Jablonski C, Kadiri H, et al. Catamenial and noncatamenial, endometriosis-related or nonendometriosis-related pneumothorax referred for surgery. Am J Respir Crit Care Med 2007; 176:1048. 2. Legras A, Mansuet-Lupo A, Rousset-Jablonski C, et al. Pneumothorax in women of child-bearing age: an update classification based on clinical and pathologic findings. Chest 2014; 145:354. 3. Bagan P, Le Pimpec Barthes F, Assouad J, et al. Catamenial pneumothorax: retrospective study of surgical treatment. Ann Thorac Surg 2003; 75:378. Q: 68 year old male was admitted to ICU for pneumonia six days ago. Patient is intubated, and on combo of sedation/analgesia. 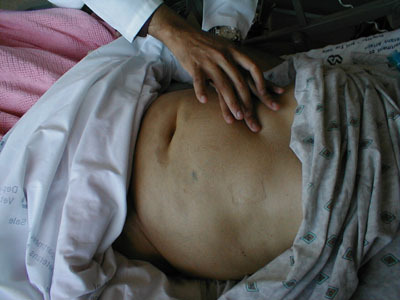 Patient has previous history of various abdominal surgeries and visible scars on abdomen. Patient continue to have high naso-gastric (NG) output. This morning patient abdominal exam shows distention as per previous days but with new finding of tympany with percussion over the upper right upper quadrant (RUQ) in liver territory. What is the biggest worry? Ileus is common in ICU, particularly in patients with previous abdominal surgeries. But percussion over upper RUQ should stay dull as liver lies there. If percussion over the liver (precisely over anterior lower right rib cage and just below right rib cage) is tympanitic, it may indicate serious complication of intestinal perforation causing intra-abdominal air. Also, sign of tenderness with percussion may call for further evaluation for peritonitis. The use of outcome measures by physical therapists to assess mobility status and functional performance of patients is a vital element of clinical and research practice in ICU. Parry et al. (Intensive Care Med (2015) 41:744–762) addressed the assessment of impairment and activity limitations in the critically ill. This manuscript is a systematic review and identified 26 measurement instruments and their clinometric properties. Interestingly, only six were ICU-specific instruments. On that same year, McWilliams et al. (2015) published the “Manchester Mobility Score”, which is also considered an ICU-specific tool. Each one of the available ICU-specific tools have their strengths and also their weaknesses. When deciding which tool to use for patients in ICU, it is important to consider the clinometric analysis to determine the best tool for an institution or individual clinician. c. Corner EJ et al. The responsiveness of the Chelsea Critical Care Physical Assessment tool in measuring functional recovery in the burns critical care population: an observational study. Burns. 2015 Mar; 41(2):241-7 PMID: 25554262.
a. Huang M et al. Functional Status Score for the ICU: An International Clinimetric Analysis of Validity, Responsiveness, and Minimal Important Difference. Crit Care Med. 2016 Aug 3. PubMed PMID: 27488220.
a. McWilliams D et al. Enhancing rehabilitation of mechanically ventilated patients in the intensive care unit: a quality improvement project. J Crit Care. 2015 Feb; 30(1):13-8.
a. Kasotakis G et al. The surgical intensive care unit optimal mobility score predicts mortality and length of stay. Crit Care Med. 2012 Apr; 40(4):1122-8. PMID: 22067629. Q: What could be the consequence of injecting air with the local anesthesia in the skin and subcutaneous tissue while inserting Central Venous Catheter (CVC) in ICU? Answer: Presence of significant amount of air in skin and subcutaneous tissue may interfere with the transmission of ultrasound waves later while putting CVC. Objective of above question is to signify the importance of good physical examination in various conditions. Skin discoloration can be of many types and can be confusing. All of the above diseases can cause carotenemia by decreasing conversion of beta carotene into retinol. Many diseases require treatment with retinol and may present with this clinical finding (case in the question) 5 . Another important cause of carotenemia is anorexia nervosa, which may present with many nutritional, electrolyte and vitamin deficiencies simultaneously. Also, it is more common in population with predominantly vegetarian diet. 1. Aktuna D, Buchinger W, Langsteger W, Meister E, Sternad H, Lorenz O, et al. [Beta-carotene, vitamin A and carrier proteins in thyroid diseases]. Acta Med Austriaca. 1993. 20(1-2):17-20. 2. Stawiski MA, Voorhees JJ. Cutaneous signs of diabetes mellitus. Cutis. 1976 Sep. 18(3):415-21. 4. Takita Y, Ichimiya M, Hamamoto Y, Muto M. A case of carotenemia associated with ingestion of nutrient supplements. J Dermatol. 2006 Feb. 33(2):132-4. 5. Dasanu CA, Dutcher J, Alexandrescu DT. Yellow skin discoloration associated with sorafenib use for treatment of metastatic renal cell carcinoma. South Med J. 2007 Mar. 100(3):328-30. Q: 54 year old male is admitted to ICU with Diabetes Ketoacidosis (DKA). Review of his home medications list showed antihypertensives which includes diuretic therapy. Which of the following diuretic (select one) is found to be associated with the Type 2 Diabetes? It is said the with each 0.5 mEq/L decrease in serum potassium there is a association of about a 45 percent higher risk of new diabetes. Thiazide diuretics causes a resultant decrease in insulin secretion. Possible mechanism is a failure of potassium channels to close in response to rising plasma glucose concentrations, causing decrease in insulin secretion. On the positive note, this risk can be mitigated by proper potassium supplement or choosing low dose of thiazide diuretics. 1. Kostis JB, Wilson AC, Freudenberger RS, et al. Long-term effect of diuretic-based therapy on fatal outcomes in subjects with isolated systolic hypertension with and without diabetes. Am J Cardiol 2005; 95:29. 2. Harper R, Ennis CN, Heaney AP, et al. A comparison of the effects of low- and conventional-dose thiazide diuretic on insulin action in hypertensive patients with NIDDM. Diabetologia 1995; 38:853. 3. Helderman JH, Elahi D, Andersen DK, et al. Prevention of the glucose intolerance of thiazide diuretics by maintenance of body potassium. Diabetes 1983; 32:106. 4. Shafi T, Appel LJ, Miller ER 3rd, et al. Changes in serum potassium mediate thiazide-induced diabetes. Hypertension 2008; 52:1022. 5. Zillich AJ, Garg J, Basu S, et al. Thiazide diuretics, potassium, and the development of diabetes: a quantitative review. Hypertension 2006; 48:219. Q: One vial of digoxin antibody (Fab) fragments binds how much of digoxin? If there is no time to calculate the dose of antibody (Fab) fragments or can't be calculated, 'rule of thumb' is to use 10 vials for adults or 5 vials for children, in acute ingestion of digoxin toxicity. DigiFab package insert. Savage Laboratories. Melville, NY 2004. Q: 24 year old scuba diver is admitted to ICU after jellyfish sting as previously he had a delayed anaphylactic reaction. Patient is complaining of massive burning at the site of sting. Nurse on duty is a wave-surfer. He advised to try topical lidocaine. Besides numbing the effected area, what added advantage lidocaine has in jelly fish sting? Answer: Lidocaine, also prevents the further nematocyst discharge! And helps to squelch the stinging cells of jellyfish still stuck to the skin. Beside lidocaine, other treatments which can be considered for symptomatic relief are ethanol and ammonia. Acetic acid has been used widely but lately fell out of favor. 1. Morabito R, Marino A, Dossena S, La Spada G, "Nematocyst discharge in Pelagia noctiluca (Cnidaria, Scyphozoa) oral arms can be affected by lidocaine, ethanol, ammonia and acetic acid". Toxicon. June 2014:: 83: 52–8. Q: Fungi are more common in peripheral vein suppurative thrombophlebitis than in superior/inferior vena cava suppurative thrombophlebitis? Though common sense may say that fungi should be more common in peripheral vein suppurative thrombophlebitis, but Fungi are more common in superior/inferior vena cava suppurative thrombophlebitis. This is particularly related to total parenteral nutrition (TPN) infusion. This is again a good reminder of discontinuation of "lines" if they are not needed. 1. Khan EA, Correa AG, Baker CJ. Suppurative thrombophlebitis in children: a ten-year experience. Pediatr Infect Dis J 1997; 16:63. 2. Strinden WD, Helgerson RB, Maki DG. Candida septic thrombosis of the great central veins associated with central catheters. Clinical features and management. Ann Surg 1985; 202:653. Q: 44 year old male with history of HIV and drug noncompliance presented to ED with mental status change and seizure. CT scan and MRI were promptly done, and patient is transferred to ICU. Astute radiologist called you to say that there appears to be a huge suspicion of tuberculoma in brain. Infectious disease service is consulted. You noticed that though treatment for tuberculous meningitis is written but no orders are written for HIV antiretroviral therapy (ART). Your thoughts? Answer: There should be a gap of few weeks between the treatment of tuberculous meningitis and ART. Initiation of ART may be complicated by the immune reconstitution inflammatory syndrome (IRIS), which can manifest as reactivation of latent TB, progression of active TB, or clinical deterioration in patients previously improving on anti-tuberculous therapy. 1. Nahid P, Dorman SE, Alipanah N, et al. Official American Thoracic Society/Centers for Disease Control and Prevention/Infectious Diseases Society of America Clinical Practice Guidelines: Treatment of Drug-Susceptible Tuberculosis. Clin Infect Dis 2016; 63:e147. 2. Pepper DJ, Marais S, Maartens G, et al. Neurologic manifestations of paradoxical tuberculosis-associated immune reconstitution inflammatory syndrome: a case series. Clin Infect Dis 2009; 48:e96. 3. Tuon FF, Mulatti GC, Pinto WP, et al. Immune reconstitution inflammatory syndrome associated with disseminated mycobacterial infection in patients with AIDS. AIDS Patient Care STDS 2007; 21:527. 4. Frequency, severity, and prediction of tuberculous meningitis immune reconstitution inflammatory syndrome. Clin Infect Dis 2013; 56:450. Q: What is "The little dutch boy maneuver" or the "Utley Maneuver"? Tracheo-innominate artery fistula is the most dreaded complication of tracheostomy, as tracheal tube tip (or cuff) erodes into the anterior wall of the trachea resulting in a fistula communication with the innominate artery. Innominate artery passes anteriorly across the trachea. This is considered to be a clinical diagnosis, as bleeding can be so abrupt and massive that there may not be anytime for diagnostic workup. "The little dutch boy maneuver" is a bedside maneuver when a finger can be placed through the tracheostomy stoma, positioned distally into the trachea, and the finger is then pulled anteriorly to compress the artery against the sternum. Substantial pressure should be applied to tamponade the artery (sufficient to lift the torso anteriorly) - till patient can be rushed to OR for emergent repair. Oral re-intubation and pass Endotracheal tube (ETT) distal to the tracheostomy site and overinflate the cuff. During all these high drama scenarios, focus should be maintained on patient's oxygenation either via tube or bag mask ventilation. 1. Ridley, R. W.; Zwischenberger, J. B. (2006-08-01). "Tracheoinnominate fistula: surgical management of an iatrogenic disaster". The Journal of Laryngology & Otology. 120 (8): 676–680. Q; 42 year old female is admitted to ICU due to Mobitz type II second degree AV block. Patient initially presented to ED with cough and fever, but admitted to ICU after astute nurse in ED noted possible AV block on monitor, later confirmed by EKG. You were unable to identify any cause of AV block from her present or family history, list of medications or physical examination. Name few disease processes which should be of your concern? It may be of interest to know that, in patients under 60 years of age who present with otherwise unexplained or previously undetected heart block, cardiac sarcoidosis has been identified in up to 35 percent of patients. 1. Nery PB, Beanlands RS, Nair GM, et al. Atrioventricular block as the initial manifestation of cardiac sarcoidosis in middle-aged adults. J Cardiovasc Electrophysiol 2014; 25:875. 2. Takaya Y, Kusano KF, Nakamura K, Ito H. Outcomes in patients with high-degree atrioventricular block as the initial manifestation of cardiac sarcoidosis. Am J Cardiol 2015; 115:505. Fusidic acid is a steroid antibiotic which is not approved in USA for use. It is developed sometimes in 1960s and is available worldwide. It is available in injections, topical (cream), eye-drops and oral forms. As resistance to various antibiotics are on rise, there is a renewed interest in its use recently. It is effective primarily on gram-positive bacteria such as Staphylococcus, Streptococcus, and Corynebacterium species. It is bacteriostatic, and so mostly used as an adjunctive treatment. It is effective for use with other antibiotics in chronic osteomyelitis secondary to MRSA; like rifampin and flucloxacillin. 2. "Fusidic acid in skin and soft tissue infections". International Journal of Antimicrobial Agents. 12 Suppl 2: S59–66. Q: All of the following are clinical criteria to liberate patient from mechanical ventilation except? Collective task force facilitated by the American College of Chest Physicians, the American Association for Respiratory Care, and the American College of Critical Care Medicine, has divided requirements to initiate patient to liberate from ventilators into basic and optional (clinical) criterias. MacIntyre NR, Cook DJ, Ely EW Jr, et al. Evidence-based guidelines for weaning and discontinuing ventilatory support: a collective task force facilitated by the American College of Chest Physicians; the American Association for Respiratory Care; and the American College of Critical Care Medicine. Chest 2001; 120:375S. Q: 34 year old female is admitted to ICU after video-assisted thoracoscopic surgery(VATS) due to persistent severe nausea and an episode of vomiting in recovery area. All of the following are predictor of Postoperative Nausea and Vomiting (PONV) except? It may be of interest to know that non-smoking status is an independent risk factor for PONV. As expected, all other choices in the question are good predictors of PONV. Female gender is considered to be the strongest overall predictor for PONV. 1. Cohen MM, Duncan PG, DeBoer DP, Tweed WA. The postoperative interview: assessing risk factors for nausea and vomiting. Anesth Analg 1994; 78:7. 2. Stadler M, Bardiau F, Seidel L, et al. Difference in risk factors for postoperative nausea and vomiting. Anesthesiology 2003; 98:46. 3. Apfel CC, Heidrich FM, Jukar-Rao S, et al. Evidence-based analysis of risk factors for postoperative nausea and vomiting. Br J Anaesth 2012; 109:742. 4. Sinclair DR, Chung F, Mezei G. Can postoperative nausea and vomiting be predicted? Anesthesiology 1999; 91:109. 5. Palazzo M, Evans R. Logistic regression analysis of fixed patient factors for postoperative sickness: a model for risk assessment. Br J Anaesth 1993; 70:135. Q: All of the following are parts of skin care to avoid pressure ulcer in long term ICU patients except? Pressure ulcers in long term ICU patients is a major issue. It is extremely underscored. Education of ICU staff including intensivists is lacking in this area. All of the choices above are true except "C" as hot water will increase damage to the skin. Q: 52 year old male with End Stage Renal Disease is admitted to ICU with fever, hypotension and probable AV graft infection. Infectious Disease (ID) service strongly suspect Infective Endocarditis (IE) but Transesophageal Echocardiography (TEE) failed to provide and definite answer of vegetation. What should be the next step to confirm or rule out Infective Endocarditis(IE)? 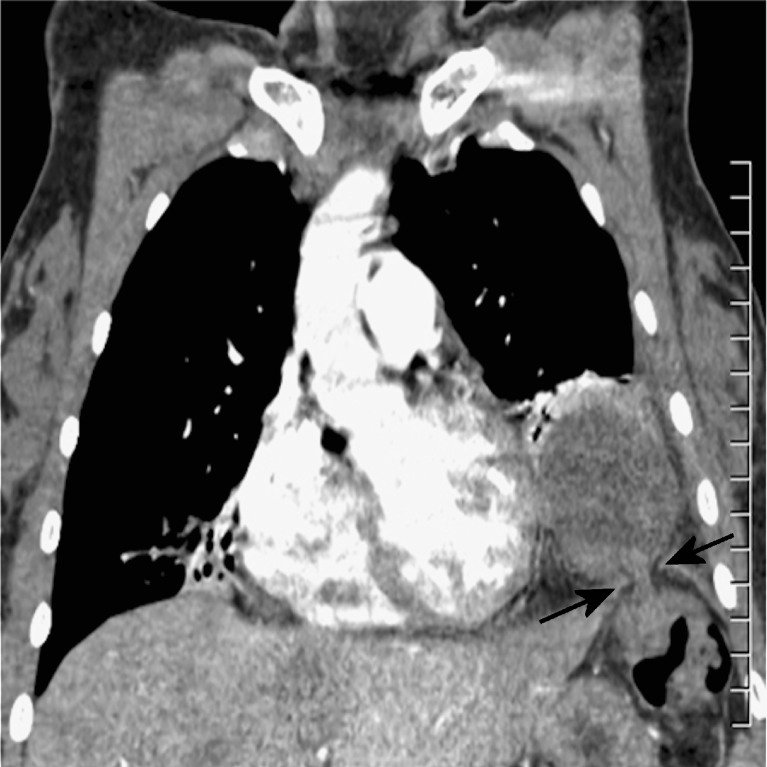 If TEE fails to provide definite evidence of IE, the next step is to perform cardiac CT. It is very sensitive, similar in accuracy to detect abscess and pseudoaneurysm, and probably superior to TEE for evaluation of paravalvular extension of infection. It also has an advantage of evaluating the coronary arteries at the same time. From logistic perspective, CT of other parts of the body can be performed at the same time if infective emboli is suspected like to brain or torso. 1. Bruun NE, Habib G, Thuny F, Sogaard P. Cardiac imaging in infectious endocarditis. Eur Heart J 2014; 35:624. 2. Feuchtner GM, Stolzmann P, Dichtl W, et al. Multislice computed tomography in infective endocarditis: comparison with transesophageal echocardiography and intraoperative findings. J Am Coll Cardiol 2009; 53:436. Q: 34 year old female who is on long term peritoneal dialysis for End Stage Renal Disease is admitted to ICU for community acquired pneumonia. Nephrology service decided to continue peritoneal dialysis while patient is in ICU. On third day of admission in ICU peritoneal fluid appeared to be blood stained. Labs including hemoglobin remains stable. Clinically patient continue to show signs of improvement. Your next step? Though there could be other causes of blood stained peritoneal dialysate but in a young female patient who has no other clinical signs of deterioration, the most common cause is menstruation unless proved otherwise! It is either due to ovulation which occurs in mid-cycle or due to endometriosis , where retrograde menstruation could be the reason of blood stained peritoneal dialysate. Alike hematuria, even one cc of blood is enough to give the whole peritoneal dialysate an appearance of blood stained. It requires rapid flushes and instillation of heparin in the dialysate to prevent catheter clotting. Usually, it clears on its own. 1. Tse KC, Yip PS, Lam MF, et al. Recurrent hemoperitoneum complicating continuous ambulatory peritoneal dialysis. Perit Dial Int 2002; 22:488. 2. Dimitriadis CA, Bargman JM. Gynecologic issues in peritoneal dialysis. Adv Perit Dial 2011; 27:101. Q: All of the following are the risk factors for refractory vasoplegia after coronary artery bypass grafting (CABG) except? Objective of above question is to highlight the dreaded situation of refractory vasoplegia after coronary bypass. Refractory vasoplegia with its domino effect can lead to more complications like postoperative bleeding, acute renal injury (AKI), liver dysfunction, neurologic dysfunction, and prolonged ventilator time. Males are more prone to vasodilatory shock than females. 1. Kristof AS, Magder S. Low systemic vascular resistance state in patients undergoing cardiopulmonary bypass. Crit Care Med 1999; 27:1121. 2. Cremer J, Martin M, Redl H, et al. Systemic inflammatory response syndrome after cardiac operations. Ann Thorac Surg 1996; 61:1714. As patients with HIV infection get admitted to ICU with acute illness frequently, it is of importance to know that viral RNA levels can be misleading and dramatically falsely elevated during acute illness, herpes simplex infection outbreak, or vaccination against many pathogens like influenza, pneumococcus, and tetanus. It takes about a month for values to return to baseline. 1. Donovan RM, Bush CE, Markowitz NP, et al. Changes in virus load markers during AIDS-associated opportunistic diseases in human immunodeficiency virus-infected persons. J Infect Dis 1996; 174:401. 2. Mole L, Ripich S, Margolis D, Holodniy M. The impact of active herpes simplex virus infection on human immunodeficiency virus load. J Infect Dis 1997; 176:766. 3. O'Brien WA, Grovit-Ferbas K, Namazi A, et al. Human immunodeficiency virus-type 1 replication can be increased in peripheral blood of seropositive patients after influenza vaccination. Blood 1995; 86:1082. 4. Staprans SI, Hamilton BL, Follansbee SE, et al. Activation of virus replication after vaccination of HIV-1-infected individuals. J Exp Med 1995; 182:1727. Due to not fully understood reasons, if dexamethasone is given after the administration of antibiotics in suspected bacterial meningitis, the likelihood of an unfavorable outcome is much higher. It can be avoided if antibiotics are already administered. 1. Leaving NG tube in post-pyloric area may have a potential for electrolyte abnormalities. 2. Relatively, NG tubes are stiffer than enteric tubes used for feeding and may damage the duodenal mucosa. Q: All of the following are indications to treat suspected digoxin toxicity with digoxin-specific antibody (Fab) fragments except? Digoxin toxicity in patients on chronic dig therapy is hard to predict, and digoxin level does not correlate with toxicity. Clinical, other laboratory parameters and EKG findings are used to predict 'dig. toxicity'. It can be very life-threatening and usually there is no luxury of time. Benefits usually outweigh risks. All of the above factors can be used to justify the use of digoxin-specific antibody (Fab) fragments, except elevated LFT. 1. Bayer MJ. Recognition and management of digitalis intoxication: implications for emergency medicine. Am J Emerg Med 1991; 9:29. 2. Antman EM, Wenger TL, Butler VP Jr, et al. Treatment of 150 cases of life-threatening digitalis intoxication with digoxin-specific Fab antibody fragments. Final report of a multicenter study. Circulation 1990; 81:1744. It is said that the first clinical description of Aortoenteric fistula (AEF) given by Sir Astley Cooper in 1829, remained same for almost two centuries - and has not changed. "A man with a pulsating tumor seized with discharge of blood by stool and who died suddenly about 12 hours later. At autopsy, the jejunum had adhered to the aneurysmal bag and that sac had ulcerated into the intestine." Cooper A. Lectures on the Principles and Practice of Surgery, London 1829. Answer: Warburg effect explains the lactic acidosis in tumor cells. It propose that tumor cells shifts their production of energy predominantly to a high rate of glycolysis followed by lactic acid fermentation in the cytosol, resulting in lactic acidosis in cancer patients. Mutations in oncogenes and tumor suppressor genes are thought to be responsible for the Warburg effect. Dr. Otto Heinrich Warburg, a German physiologist and a physician was the sole recipient of the Nobel Prize in Physiology or Medicine in 1931. He was nominated for the award 47 times in his life. 1. Friedenberg AS, Brandoff DE, Schiffman FJ. Type B lactic acidosis as a severe metabolic complication in lymphoma and leukemia: a case series from a single institution and literature review. Medicine (Baltimore) 2007; 86:225. 2. Sia P, Plumb TJ, Fillaus JA. Type B lactic acidosis associated with multiple myeloma. Am J Kidney Dis 2013; 62:633. Abdominal muscle reflects expiratory muscle strength. The most objective way is to measure gastric pressure, via gastric balloon catheter following maximal cough efforts. Gastric measurement is not a part of everyday ICU clinical practice but objective of above question is to highlight the role of abdominal muscles in the process of respiration specially to watch for these during weaning/extubation process. Man WD, Kyroussis D, Fleming TA, et al. Cough gastric pressure and maximum expiratory mouth pressure in humans. Am J Respir Crit Care Med 2003; 168:714. Q: 34 year old female with no significant past medical history is admitted to ICU with ischemic stroke, confirmed by CT and follow up MRI in ED. Enthusiastic medical student did proper physical exam and reports the presence of 'livedo reticularis'. What is the most probable diagnosis? It is called “Sneddon's syndrome”. One of the clinical systemic finding (present in about 20% of the patients) in patients with aPL and an ischemic cerebrovascular disease is livedo reticularis. Interestingly, after deep vein thrombosis (DVT) and thrombocytopenia, this is the most common clinical finding in patients with aPL. Other clinical findings may be superficial thrombophlebitis, pulmonary embolism and fetal loss. To note, stroke is found to be more common than transient ischemic attack (TIA) in patients with aPL. 1. Levine SR, Langer SL, Albers JW, Welch KM. Sneddon's syndrome: an antiphospholipid antibody syndrome? Neurology 1988; 38:798. 2. Francès C, Papo T, Wechsler B, et al. Sneddon syndrome with or without antiphospholipid antibodies. A comparative study in 46 patients. Medicine (Baltimore) 1999; 78:209. 3. Cervera R, Piette JC, Font J, et al. Antiphospholipid syndrome: clinical and immunologic manifestations and patterns of disease expression in a cohort of 1,000 patients. Arthritis Rheum 2002; 46:1019. Q: All of the following are the predictors of intubation in Guillain-Barre Syndrome (GBS) Except? Q: What are the five core recommendations from "choosewisely"- Critical Care Societies Collaborative? Answer: Choosing Wisely® is an initiative of the ABIM (american Board of Internal Medicine) Foundation. Website is www.choosingwisely.org. 1. Don’t continue life support for patients at high risk for death or severely impaired functional recovery without offering patients and their families the alternative of care focused entirely on comfort. 2. Don’t deeply sedate mechanically ventilated patients without a specific indication and without daily attempts to lighten sedation. 3. Don't use parenteral nutrition in adequately nourished critically ill patients within the first seven days of an ICU stay. 4. Don’t transfuse red blood cells in hemodynamically stable, non-bleeding ICU patients with a hemoglobin concentration greater than 7 g/dL. 5. Don’t order diagnostic tests at regular intervals (such as every day), but rather in response to specific clinical questions. Q: 24 year old male is admitted via ED to trauma-ICU after motor vehicle accident. Radiology called to inform you that patient has collar sign. What is collar sign? Answer: The collar sign is also called the hourglass sign. It is mostly present in diaphragmatic rupture. It is due to a waist-like or collar-like appearance of herniated organs at the level of the diaphragm. Q: What are the six different types of mechanism for Serotonin Syndrome (SS). Give at least one example of each with commonly used drug which can precipitate SS? Boyer EW, Shannon M. The serotonin syndrome. NEJM 2005; 352:1112.